We’ve had our heroes at Burnley over the years, often special players who have graced Turf Moor on many occasions. Today we can wish a happy 81st birthday to Trevor Meredith, a player who, despite never being a regular, certainly left his name in Burnley folklore on 2nd May 1960 at Maine Road, Manchester. Trevor had only made his debut just over three weeks earlier but this was his seventh league appearance in the first team; his debut was due to regular outside-right John Connelly being on international duty but he then stood in for Connelly when he suffered a knee injury. When he scored that winning goal against Manchester City which crowned Burnley as champions of England, it was already his third goal, and that included a precious goal in a 1-1 draw at Blackpool. That he was at Burnley in the first place was down to his team mate Walter Joyce. Meredith was a farmer’s boy from Shropshire who learned his football skills by kicking a ball against a barn door, but he and Joyce met on National Service. 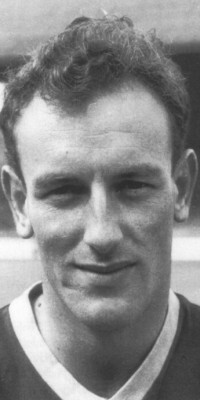 He was playing for Kidderminster Harriers in non-league but Joyce recommended him to Burnley and he duly signed in November 1957 at the age of 20. It wasn’t to be the start of a glittering career. With Connelly fit again and with the emergence of Willie Morgan, Meredith was never able to establish himself in the first team and by the time he left at the end of the 1963/64 season he’d made just 37 league appearances and scored eight goals. He returned to his home county and signed for Shrewsbury where he played for eight years, scoring 41 times in 235 league appearances before retiring from the game. He was even afforded the opportunity to return to Turf Moor and play for his new club in the League Cup in 1966 but it proved to be a difficult night for them with Burnley convincing 5-1 winners. He became a teacher in the Preston area having left football and, I believe, continues to live in the area. I met him in 2010 when he came to one of our Youth Foundation dinners, and I’ve spoken to him on a couple of occasions since. I liked him; I was surprised at how well spoken he was, although I’m not sure why, and he came across as a gentleman. Many players have had longer careers at Burnley; many have had much more distinguished careers at Burnley, but it’s a short list Trevor Meredith finds himself on as the player whose goal lifted the title for Burnley.